“Britain Unlimited” covers 250 of Great Britain’s most famous people. It tells who they were, what they did, where they went and what inspired them, so that you too can follow in their footsteps for research or purely for pleasure. Select one of the menus below for details of the person you wish to find. The research for Britain Unlimited is done from a variety of secondary sources too many to mention including published books, pamphlets, guidebooks and the internet. No one topic is exclusively derived from a single source. The information is as accurate as we can make it however history is constantly being re-interpreted and many items may change over the course of time. We are always endeavouring to check Britain Unlimited for accuracy and welcome any corrections or additions from individuals. Most of the information in this site is based on collective wisdom on the topic and we have tried to steer clear of information, which is controversial. The photographs for Britain Unlimited are all taken by the author himself and remain the copyright of the author. No external or commercial photographs are used. Any artworks shown are clearly marked with the organisation that holds them in their collection and if you require hi-resolution images we suggest you go directly to that organisation. Note: Some charge for this service. 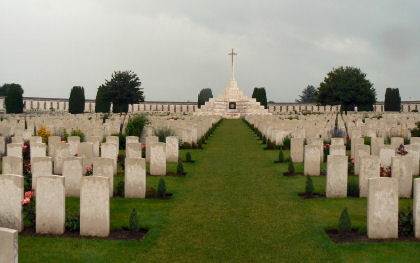 Obviously not in Britain but in Flanders, Belgium, but after a trip to the Ypres Salient in 2008. I was moved to offer this picture of Tyne Cot Cemetery as a memorial to the fallen of Britain and the Commonwealth during 1914-18 and indeed in all wars.